When we first started talking about peak oil (I heard about in 2004) we were worried about the price of oil going over $100 a barrel. Many people say “They will find something” They hear a radio item about shale gas being plentiful and are happy. Or others might dismiss it as a plot by the left. As oil gets discovered in so many new corners of the globe, people now say the concern about peak oil was unnecessary. But actually, because of climate change, almost all those resources have to be left in the ground! 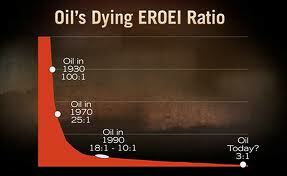 Once a barrel of oil would be enough energy to extract 100 barrels of oil. But nowadays we need much more energy to get energy. Then we had the Global Financial Crisis in 2008 and all got busy worrying about housing bubbles, derivatives, debt bubbles, too big to fail banks and bailouts. This is all important stuff. The price of oil declined as the global economy declined and now keeps repeating these waves. Affordability oil became the issue. In 2012 that same brother in law commented that my worry about oil was unfounded as the oil price hadn’t gone up as much as forecast and “they were always finding something”. Now I realise what is happening and there is no better little book to explain it than the one former Green Party leader Jeanette Fitzsimons recommended in a recent talk run by the local Quakers. The book that blew her mind was The Perfect Storm – Energy, Finance and the End of Growth by Tim Morgan, Global Head of Research at finance broker Tullett Prebon. It is freely downloadable at http://ftalphaville.ft.com/files/2013/01/Perfect-Storm-LR.pdf. I have printed it off and had it bound. Morgan says: There are four factors bringing down the curtain on growth. The economy as we know it is facing a lethal confluence of four critical factors – the fall-out from the biggest debt bubble in history; a disastrous experiment with globalisation; the massaging of data to the point where economic trends are obscured; and, most important of all, the approach of an energy returns cliff-edge. The economy is a surplus energy equation not a monetary one. Too much energy has to be reinvested into energy extraction and too little energy is left for the essentials of food, government services, housing and investment. The interesting thing is that Tim Morgan works for Tullett Prebon. It is the messenger which is unusual saying all these things. It isn’t Richard Heinberg or some sandal wearing, folk dancing greenie. In a way Tullett Prebon seems to be taking over where Matt Simmonds left off. 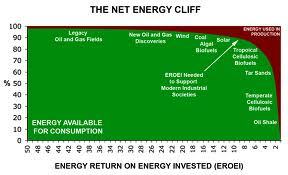 I think the most scary thing in his whole book is the graph of the energy returns cliff. While we blithely go into debt to build motorways and while we waive civil rights to protest at sea about deep sea oil drilling, it must be worthwhile paying attention to what this energy firm is saying.